Aproveche al máximo su tiempo en el puerto con una visita privada a la Toscana parando en Florencia y Lucca. Sea recibido con un cartel de bienvenida personalizado mientras desembarca de su barco y luego viaje cómodamente en un Mercedes de lujo durante el recorrido. Vea los lugares más destacados de Florencia, como Ponte Vecchio, y tómese tiempo libre para almorzar y comprar antes de detenerse en Lucca, donde puede hacer un recorrido en bicicleta por la muralla de la fortaleza si lo desea. 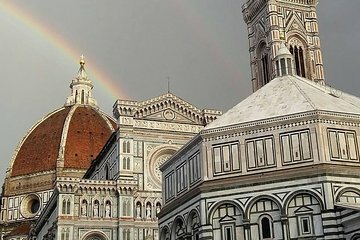 Vea el Duomo de Brunelleschi y haga un recorrido en bicicleta por la pared de Lucca si lo desea. Viaja con comodidad en un Mercedes de lujo para el día. This was one of the highlights of our entire three-week trip around Europe! Our guide, Simona, was absolutely fantastic. We could not have gotten luckier with her. She's so warm and friendly and funny. She made a short detour on our way to Florence to show us Tuscan wine country, and it's every bit as magical as you might expect it to be. If you're in this area for the first time, DO NOT skip out on Florence! I didn't expect to like the city so much, but it has so much character and history and beauty. Simona got us right up to all of the best tourist sights and gave us information about them. We had tickets to the Accademia gallery to see Michelangelo's David, and she even went with us to get our tickets and get us in earlier than we'd planned. Then we drove to Lucca, which is an adorable little walled town, like a quieter Florence with fewer crowds. We were hesitant to book this tour because it had no reviews and was new to Viator, but I'll forever be glad we did because it couldn't have been better. Thank you to Under the Tuscan Sun tours and Simona for making our day amazing! !